It seems I'm seeing hydrangeas everywhere. old drawers.....every kind of container imaginable. I have a serious case of hydrangea envy. So, I thought I would share my hydrangeas. this is it. What you see, is all there is. and struggling hard to grow and bloom. But, one day, I will have lots of beautiful hydrangeas. I better start collecting my creative containers! I totally relate to your hydrangea envy... I have it BAD!!! I so love any hydrangea. I gingerly planted one in my yard in dappled light this year. It's a beautiful mop head.. unfortunately I'm zone 3A....I may be doomed to fail with this but we'll see. I'm going to be optimistic! You're hydrangea is very, very pretty! You are wondrous fair like these that you love so! 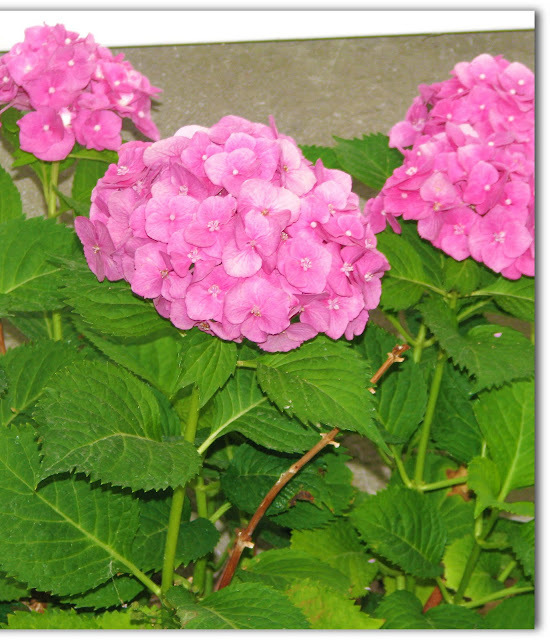 Enjoy your little hydrangea and I thank-you for showing us its beauty. Blessings. I have 2 HUGE bushes that are usually COVERED in blooms come spring. This year? Not one single bloom. NADA! ZIP! ZERO! ZILCH! It's horrible. Luckily I have 4 more much smaller bushes that are blooming their silly little heads off, but my big ones are usually just gorgeous. Wonder what's up? Thanks for sharing your pretty pink blooms. We'll take what we can get! Yes...I am a member of the hydrangea envy club. BIG time. However, I cannot grow them here in this southwest oven! How I miss them. The old fashioned white ones seem to grow everywhere in Connecticut and I could not wait for the cool nights of Sept. and Oct that would turn them a beautiful dusty mauve..then my bff and I would pick them and hang them and let them dry...they stick them in our Christmas trees...so very lovely. Yes, I have hydrangea envy. I love them so much too, and these look just like my pink ones at our previous house. I had a beautiful yellow bush called Limelight Hydrangea that grew taller than me, they are gorgeous. Always wanted blue ones or purpley color but mine always turned pink.